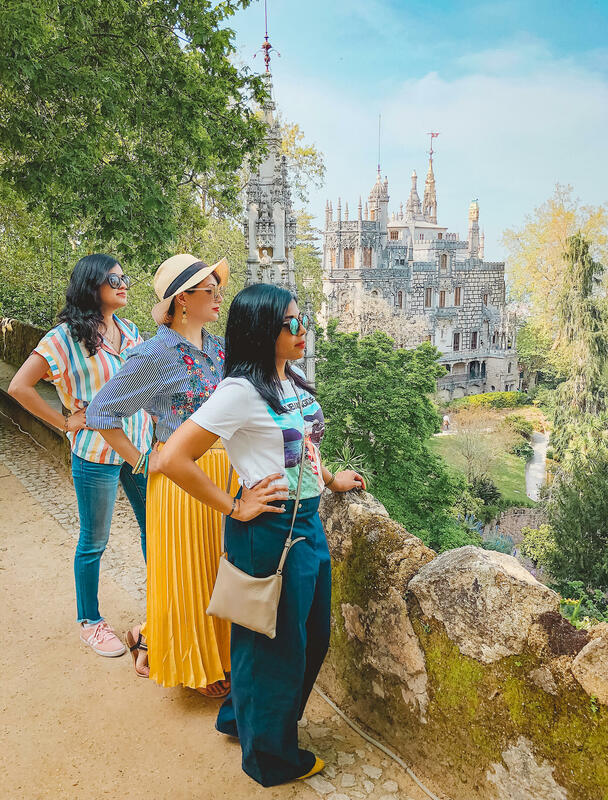 As it turns out, I wasn’t the only person enamored with Sintra - it’s the most popular day trip from Lisbon! If you visit Lisbon, I’d highly recommend you stop by Sintra too. 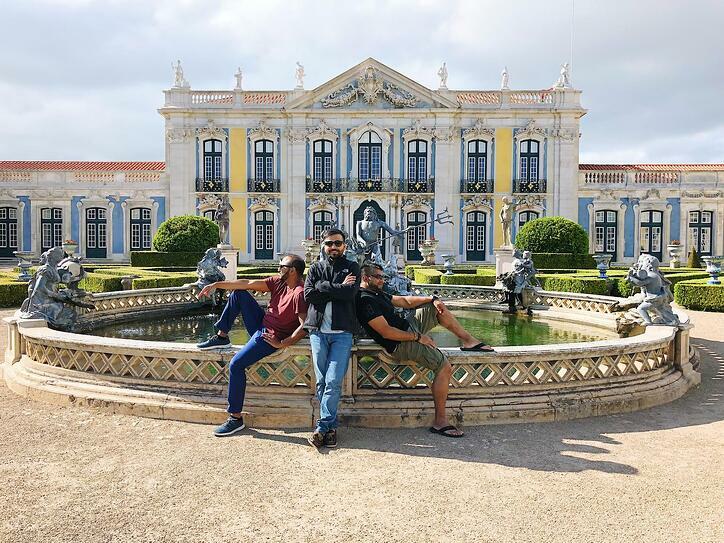 Saad and I spent an entire day exploring Sintra with our friends on our 2018 couples’ trip. 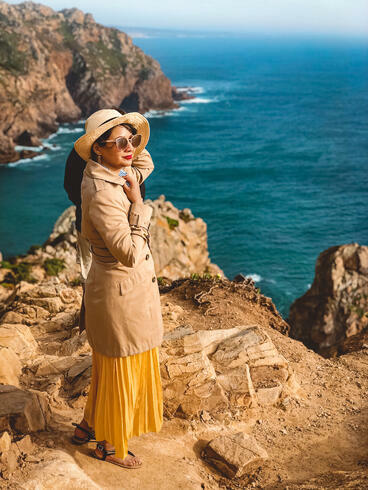 We explored three palaces, which were all distinct from each other, and also stopped by Cabo da Roca, the westernmost part of Europe. Unlike sane most people, we opted to take our ginormous 9-seater van to Sintra instead of the train. The drive from Lisbon to Sintra is not long, but as you get closer to the palaces, the roads become narrow, steep, curvy, and crowded. It’s not the easiest terrain to traverse unless you’re an experienced and confident driver (with an international license). Luckily for us, Saad checked all of those boxes so we took our van, relying on the Waze app for directions (it works better than Google Maps in this region). Travel tip: Since we visited Sintra in April, just before peak season, we were able to find parking near the palaces. 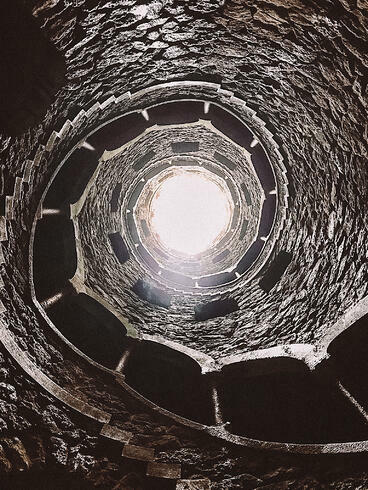 If you visit Sintra during the summer months, it’ll be much tougher. 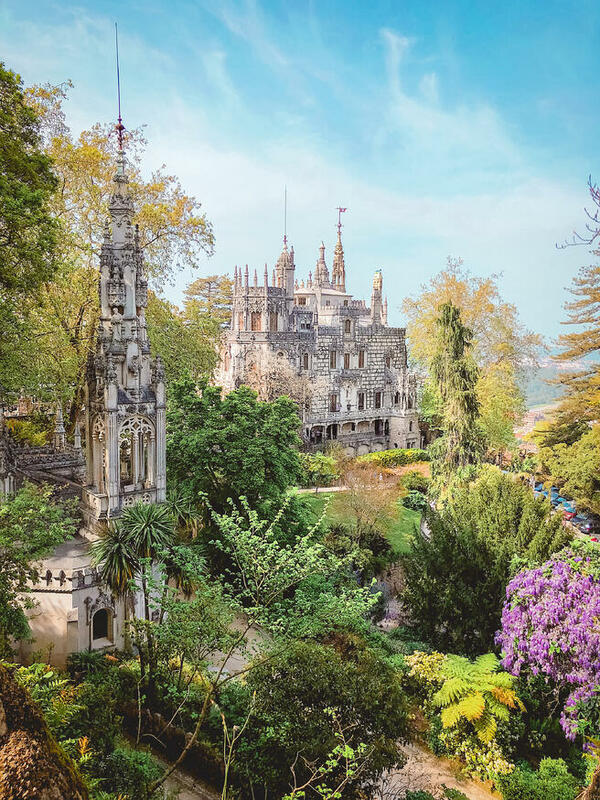 Instead of driving, hop on the train to Sintra from Rossio Station and then board the 434-tourist bus, which will take you up the hills of Sintra to see Pena Palace and the Castle of the Moors. P.S. 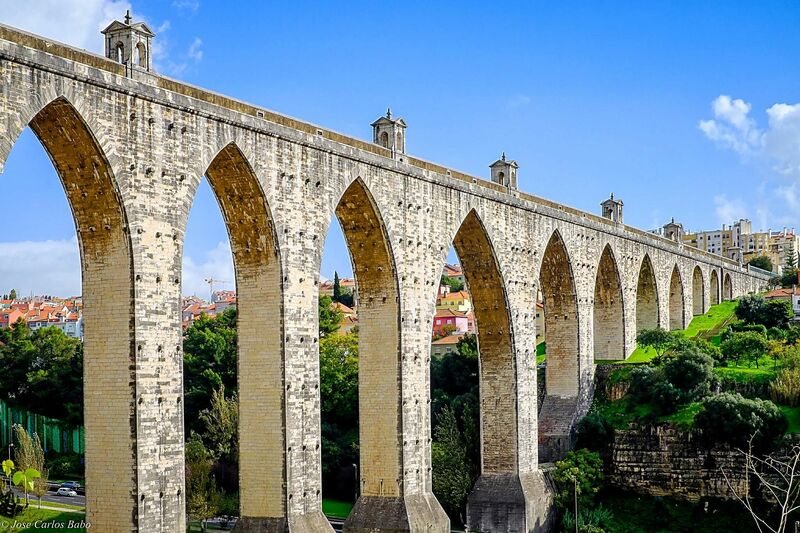 Look out for the Águas Livres Aqueduct on the way to Sintra! 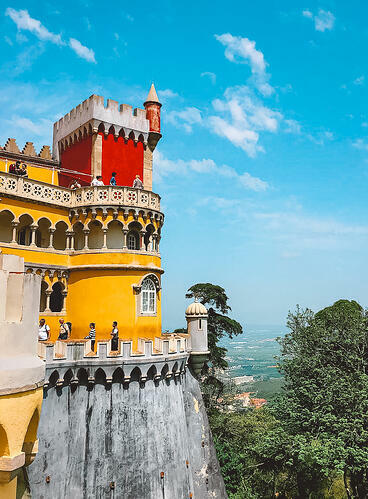 Perched on top of the Sintra mountains is the striking Pena Palace. 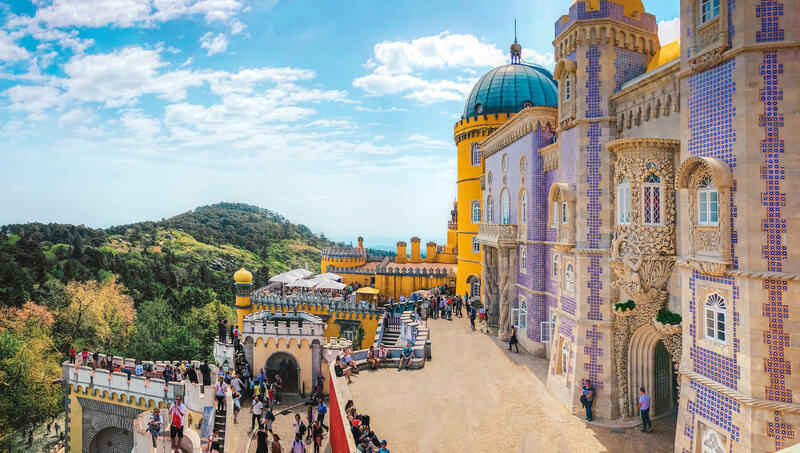 Pena Palace was commissioned by King Ferdinand II, who wished for a royal summer residence to rival the stunning Neuschwanstein castle in Bavaria. So, he purchased the ruins of the monastery that once stood in this location and ordered the construction of Pena Palace. 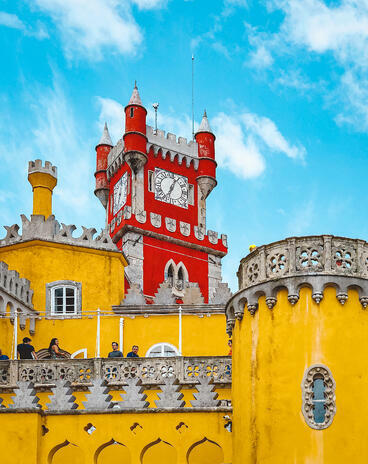 Pena Palace was built during the Romantic era (ooh la la), which was a movement that emphasized intense emotion, artistic freedom, nature, and revived medieval folk art. I share this architectural tidbit because it explains why the palace’s facade is a harmonious hodgepodge of colors and styles. 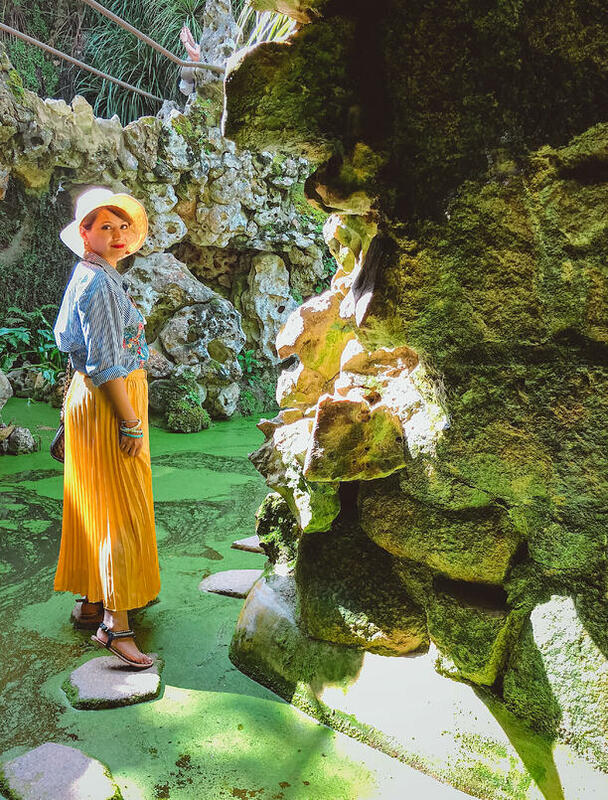 In less fancy words, it explains why Pena Palace is super colorful and exotic looking. 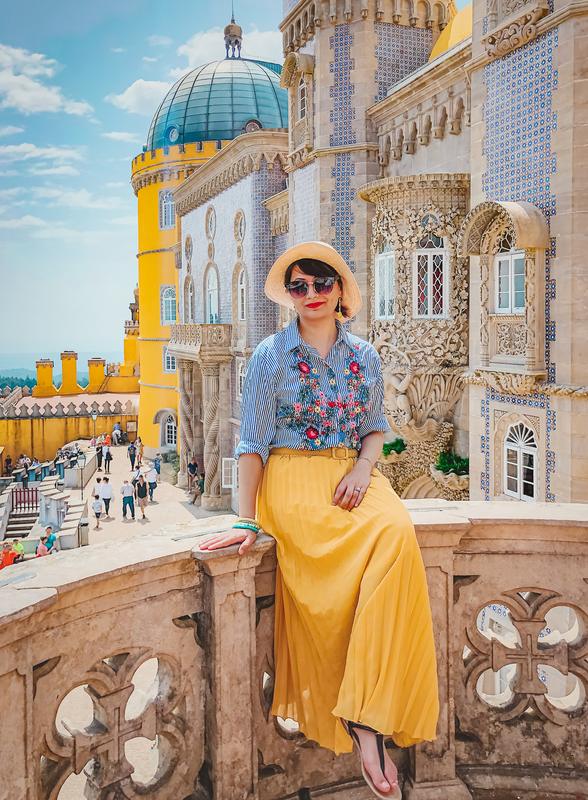 I’ve been fortunate enough to tour a few palaces in Paris and Germany, but Pena Palace stands out from the rest in its flamboyance. 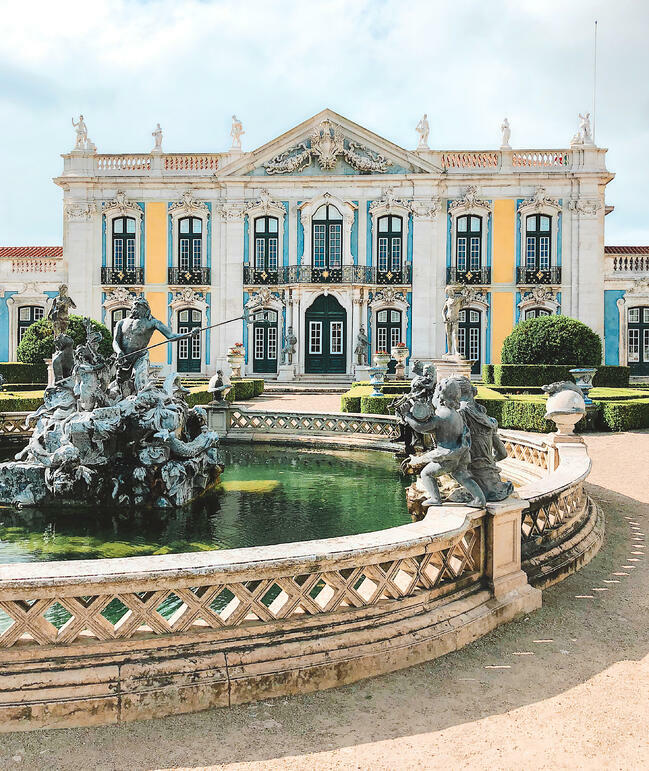 The palace’s exterior is painted in bright tones of yellow and red, with purple tilework adorning the entrance - colors that evoke emotions like happiness, power, and awe. 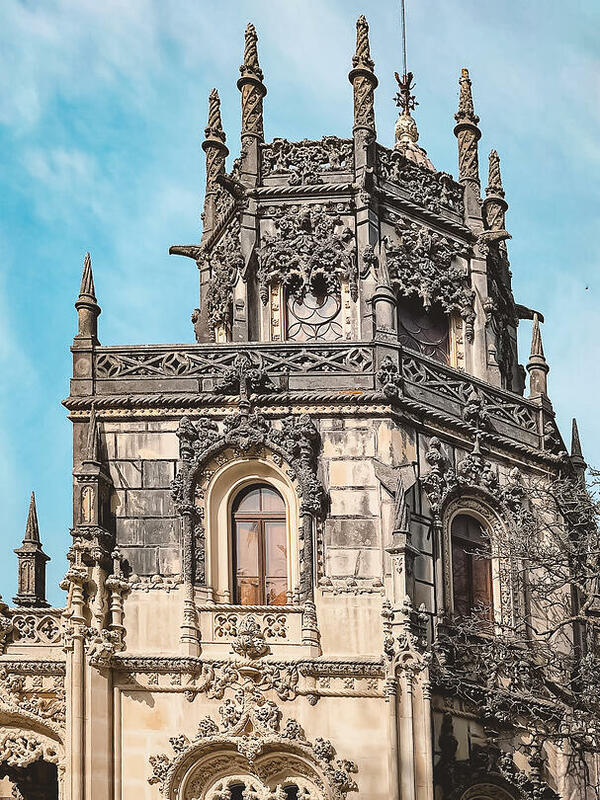 In keeping with the Romanticism movement, the palace also intentionally combines elements of Neo-Islamic, Neo-Gothic and Neo-Renaissance styles in its towers, terraces, chapel, and decorative mythological statues. 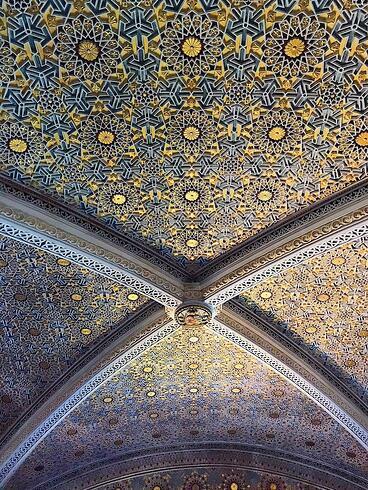 Inside, the palace (now turned museum) contains vaulted rooms that are as intricate and colorful as the outside. 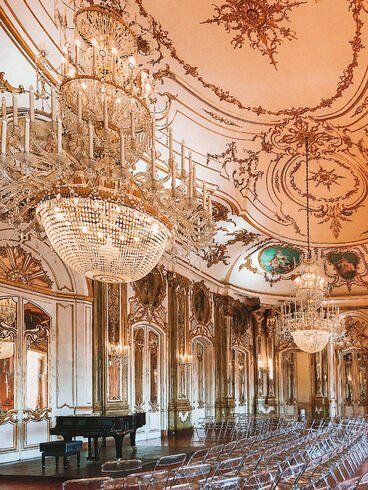 A few of the rooms we walked through were the Royal Dining Room, the Noble Room, and the Queen’s Chambers. By the way, the best spot to get an overall picture of the palace’s architecture is the Queen’s Terrace… unless you have a drone that can get that sweet aerial shot. Travel tip: Remember, Pena Palace is situated on top of mountains, so you’ll need to trek uphill to reach it. There are two paths you can take: the longer, scenic path through the gardens or, the quicker dirt road one. I’d recommend walking through the lush green gardens. 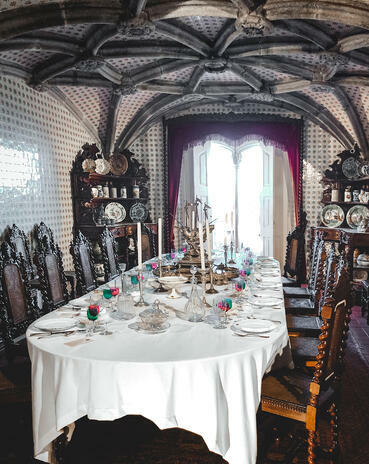 If you visit Pena Palace, come early to avoid the crowds (the palace usually opens at 9:30 am) and buy your admission tickets online. 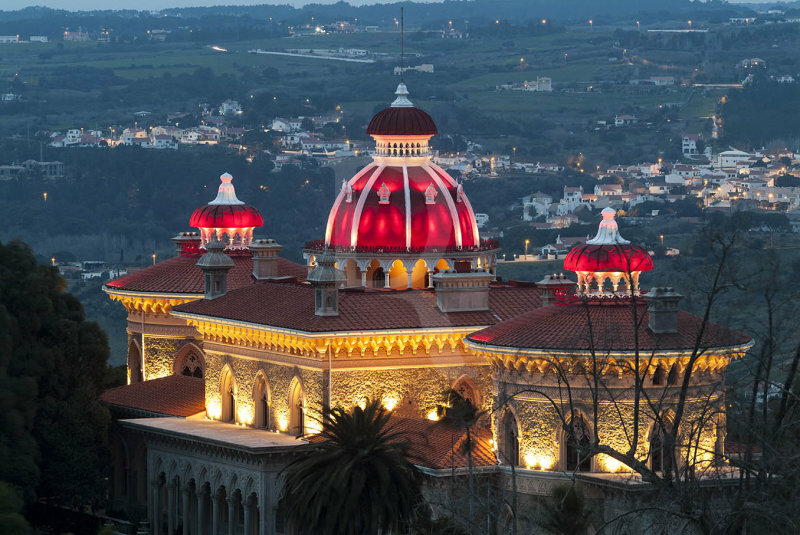 Located on a mountaintop adjacent to Pena Palace, is the Castle of the Moors. As the name implies, it was a castle built during the Muslim reign of Portugal to guard the agricultural town of Sintra. Although the castle fell into disrepair after the Christian conquest of Portugal, it was later restored by King Ferdinand II. 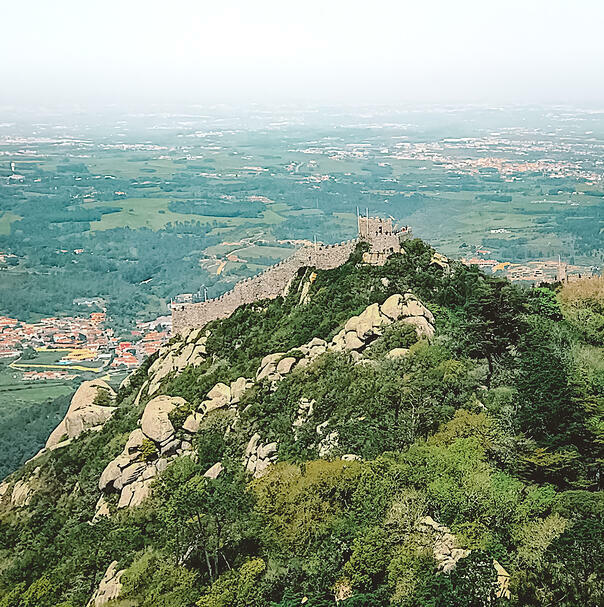 Today, the castle consists of fortified stone walls and battlements surrounded by massive boulders that offer panoramic views of Sintra. We didn’t have time to actually visit this castle, but we did see it from one of the terraces of Pena Palace! 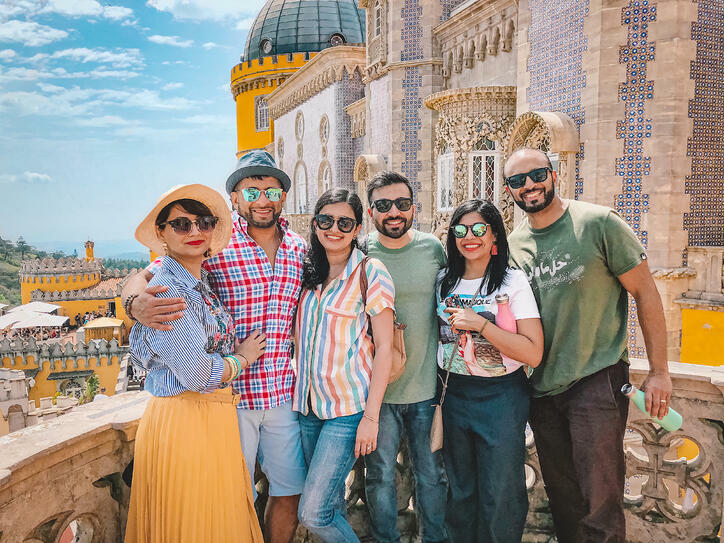 Because of their proximity to each other and altitude, you can see the Castle of the Moors from Pena Palace and vice versa. If you have time and are up for a climb, I’d recommend stopping by the castle. 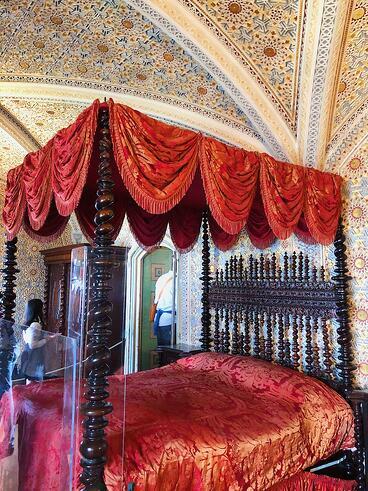 Travel tip: The castle is open seven days a week, including Monday (when other Lisbon monuments are closed). You can purchase tickets and get more information on its visiting hours here. Cinderella's castle or Quinta da Regaleira? I thought the palace was equal parts beautiful and eerie. 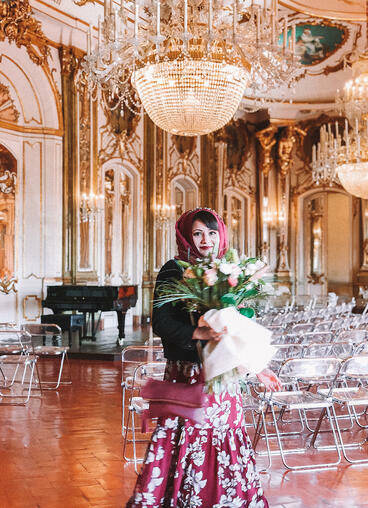 The palace is surrounded by an expansive park full of lakes, trees, flowers, and fountains. 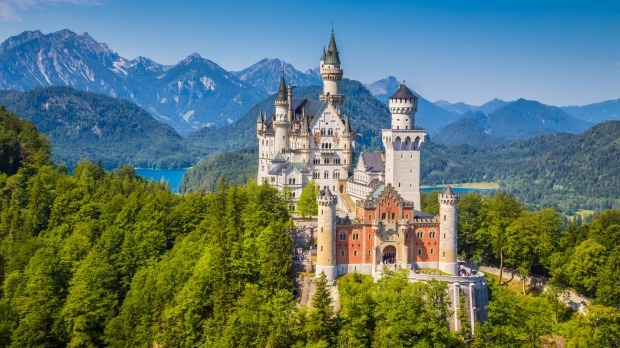 The juxtaposition of the grey, gothic structure against the wild forest is a picture right out of a fairytale. Don’t believe me? See our insta-hubby directed photoshoot below. 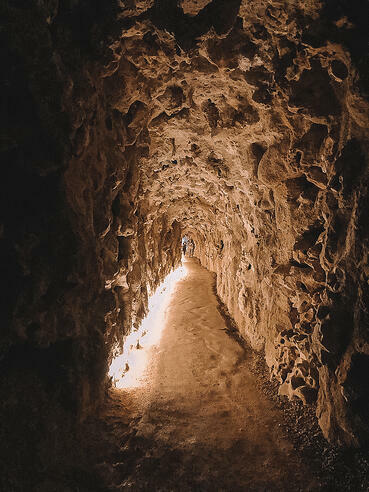 However, the grounds also contain a system of underground tunnels, dimly-lit grottoes, and “initiation wells” that were, rumor has it, used for mysterious ceremonial purposes and secret society meetings. What did I tell you - eerie, right? 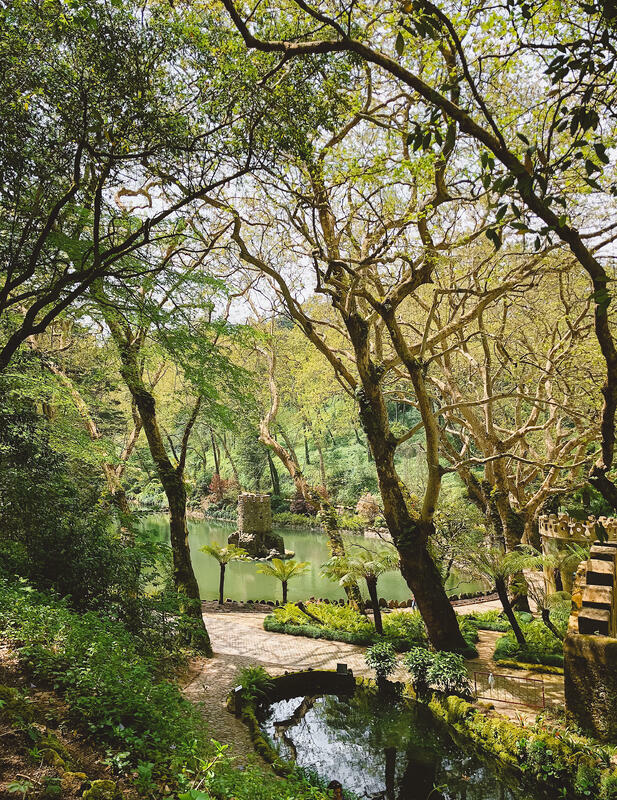 Travel tip: Spend the majority of your time exploring Quinta da Regaleira’s gardens - its surrounding landscape is much more interesting than its interior (at least in my humble opinion). You can even venture down into the caves if your husband makes you you’re brave, but fair warning that it’s dark and drippy. 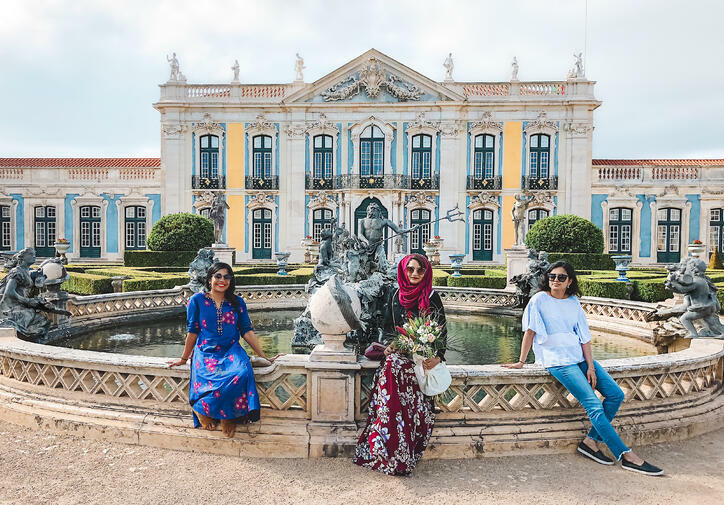 The last stop on our tour of Sintra’s palaces was the Palace of Queluz, which was the residence of Queen Maria I and her husband Dom Pedro. 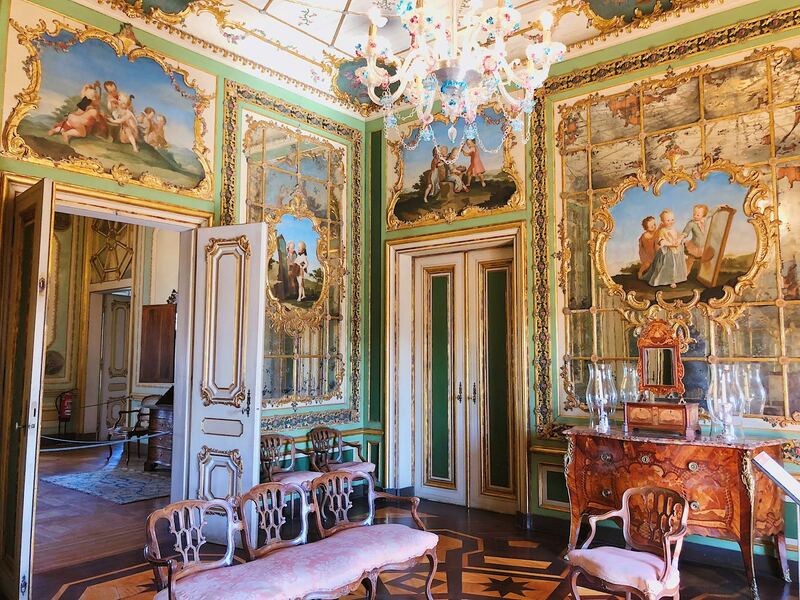 The palace’s exquisite Baroque-style architecture, ornate furnishings, and cheerful pastel appearance once concealed a sad truth: that Queen Maria I descended into madness following the death of her husband and son. It was both a palace and a prison for the ill-fated Queen, a place of both joy and great sorrow. 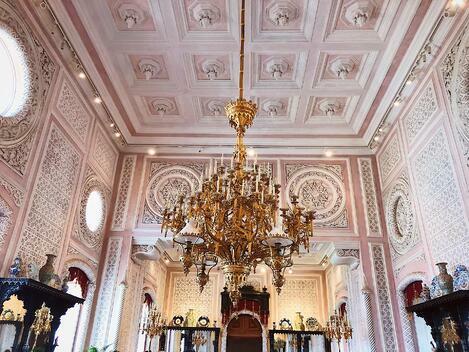 But don’t let the palace’s history discourage you from visiting. Instead, let the following pictures encourage you! 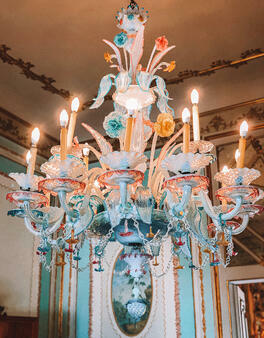 The Palace of Queluz was designed with the utmost attention to detail. 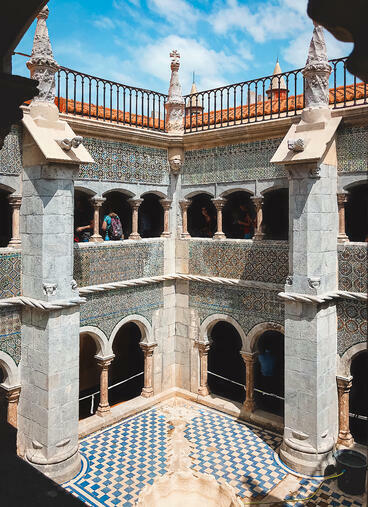 Two unique features of the palace are the use of azulejos (painted Portuguese tiles) and its glorious gardens. 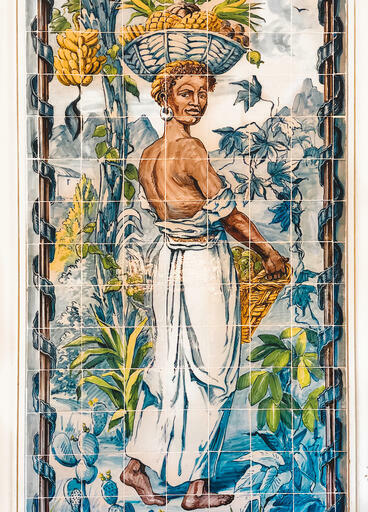 The tiles illustrate scenes from history, in tones of blue and yellow with muted reds. The gardens are graced with sculptures and fountains, including the Fountain of Neptune. 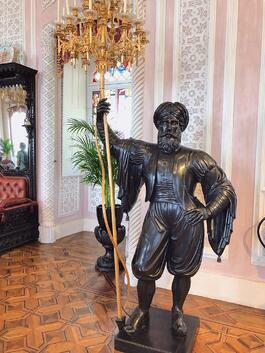 Travel tip: The palace offers guided tours in English at 10:30 am. No prior booking is needed. After seeing three palaces, we were pretty tired and overstimulated by all of the colors, statues, and murals. 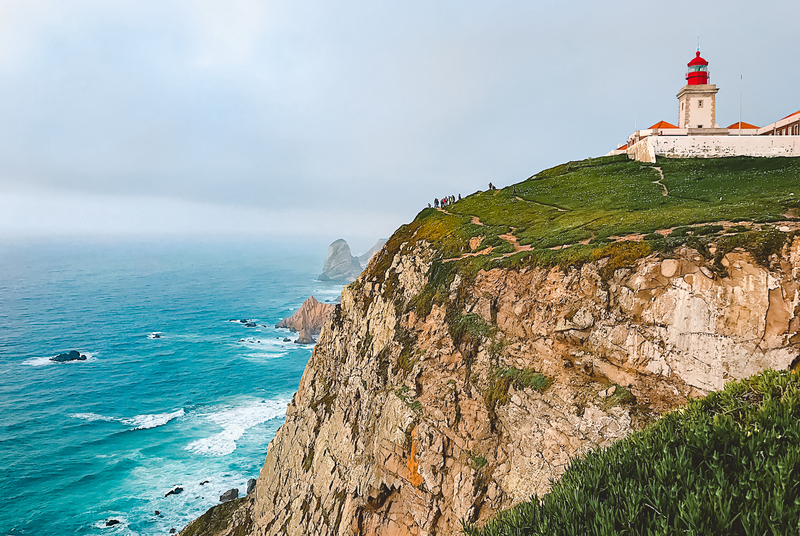 So instead of checking out even more palaces, like the National Palace of Sintra or Monserrate Palace, we decided to change things up and get some fresh air at Cabo da Roca. 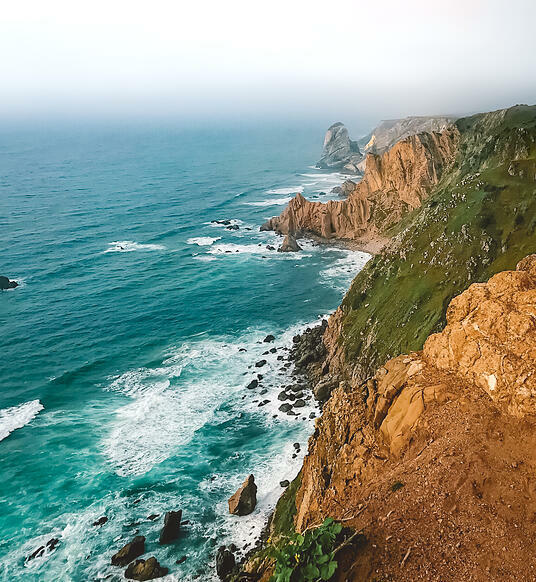 Cabo da Roca is the westernmost point of continental Europe, meaning you can see America on the other side this area borders the Atlantic Ocean. 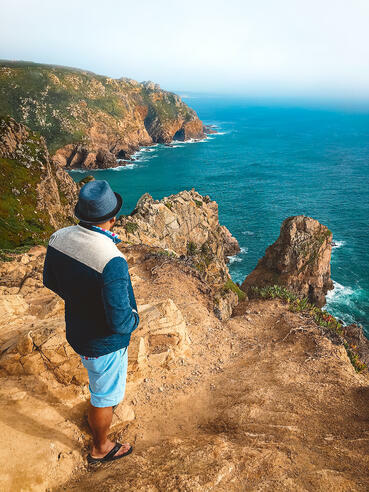 Cabo da Roca is comprised of rugged cliffs that tower above the sea, a lighthouse, and walking trails that offer dramatic vantage points of the surrounding coastline. We went to Cabo da Roca right before sunset and the views were breathtaking (as was the light for photos 💁🏽‍♀️). 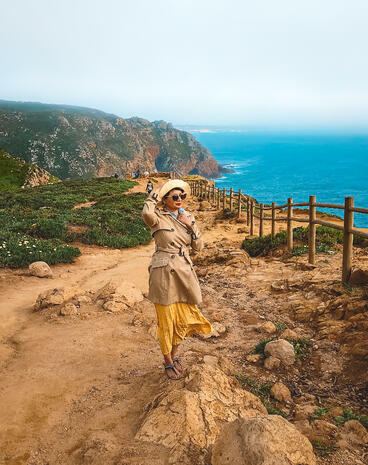 Travel tip: Because it borders the ocean, Cabo da Roca is always very windy. Bring a jacket and brace yourself for cold temperatures no matter how hot the rest of Sintra is. 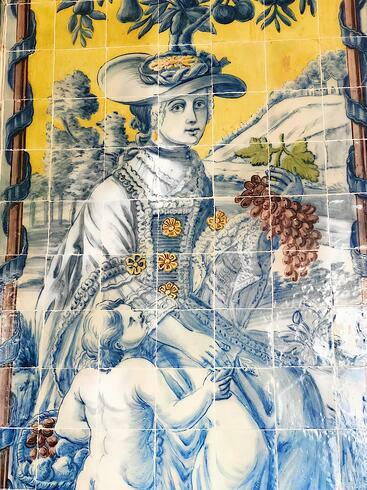 So, with Lisbon and Sintra under our belt and what seems like a million squares, palaces, and gardens visited, were we done with our Portugal trip? Nope! When we travel to a new country, we really explore and hop around everywhere ...which is fun but also exhausting. That’s why we ended our trip with a relaxing visit to the south of Portugal, home to some of the world’s best beaches. 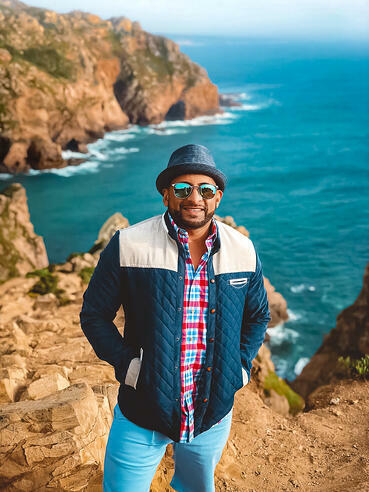 In my final post about Portugal, I'll show you around the Algarve region. 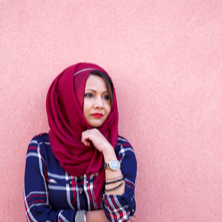 I’m a twenty-something Muslim blogger who’s guilty of falling in love with every place I visit. I’m always planning the next trip in my head and missing the last one in my heart. When I’m not off discovering new parts of our beautiful planet, you can find me happily immersed in an art project. I have a slight obsession with lanterns that may or may not have stemmed from the lantern scene in Tangled. I incorporated big, colorful lanterns into my mehndi (henna) night decor and I have faceted lanterns full of candles and lights around my home. I also made a string of paper lanterns for my Eid party - and that’s what this post is all about! Here’s a simple tutorial on how to make hanging paper lanterns to jazz up your next event. 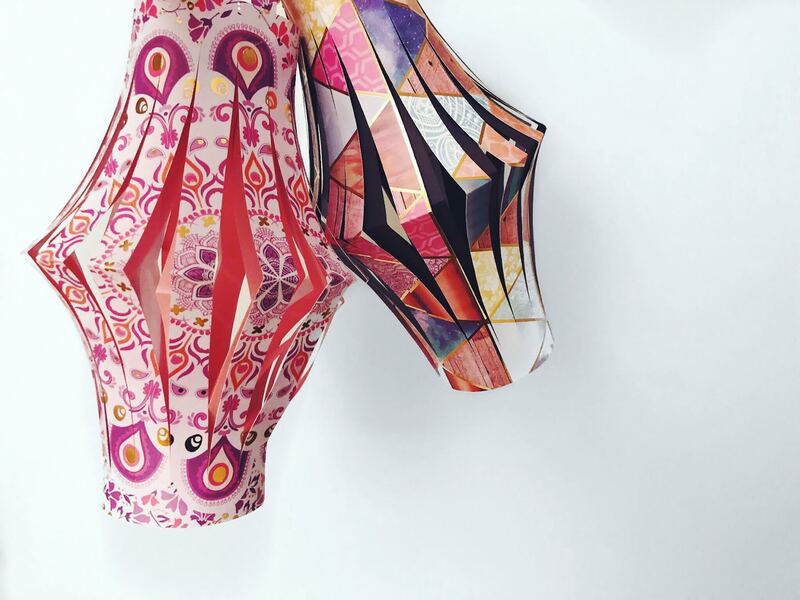 You may have made these lanterns in school during arts and crafts, but now it’s time to make them the adult way with fancy pants paper and hot glue (#adulting). 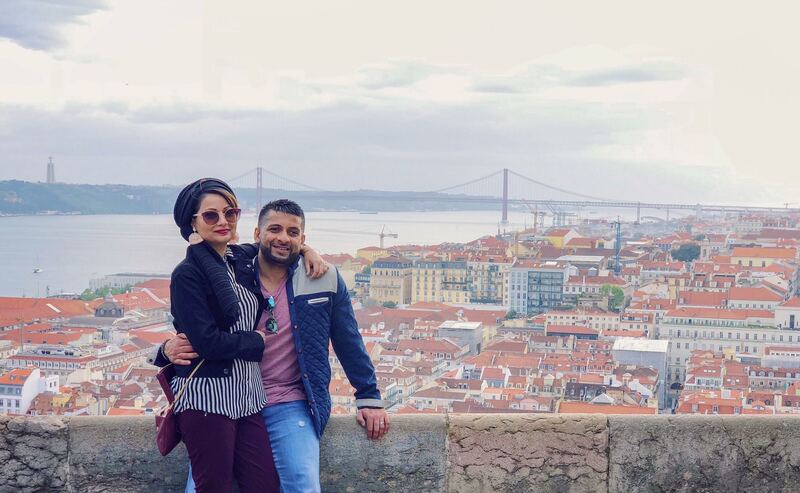 Every year, Saad and I try to take at least one trip abroad with friends, who are more like family. In 2017, we traveled to Italy, which was a litmus test for our couples’ chemistry and ability to travel together in a group. This year, we recruited our usual A-team crew for another European getaway - to Portugal! Admittedly, Portugal wasn’t high up on our list of places to visit because 3 out of the last 4 trips we’ve taken have been to Europe.